Description: Rolling Stone 500 Greatest Albums of All Time - Rated 280/500! Mastered by Kevin Gray! Includes two bonus tracks! 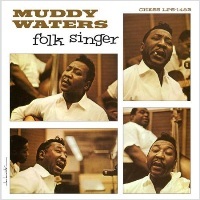 Folk Singer represents a departure from the electric 'urban' blues sound that Muddy Waters pioneered. This all-acoustic collection of recordings illustrates his deep-rooted rural blues influences, reminiscent of the sides he made nearly twenty-five years prior in Mississippi. This release features McKinley Morganfield (Muddy Waters) on vocals and guitar, supported by a very young Buddy Guy on guitar, blues legend Willie Dixon on upright bass and Clifton James on occasional drums. · Mastered by Kevin Gray! · Includes two bonus tracks! · This Hybrid SACD is playable on ALL CD Players!